Thou relations had improved with the West following the Sino-Soviet split, China failed to lay its hands on Western smoothbore technology, which was geared towards defeating the Russian T-80 & T-72 tank armour, something the Chinese PLA also wanted to do. They started a program in the late 1970’s/early 80’s to develop a 120mm smoothbore that could do this and though testing proved successful, they stuck with what they knew best, which was the Russian based 125mm smoothbore. The 120mm smoothbore continued to be developed by 774 Factory as what would be better described in comparison to that of the 125mm based MBT’s production, a side project as the Type 89 anti-tank gun. The Chinese PTZ89 aka Type 89 Tracked Tank Destroyer prototype was completed in 1984, and the fire test was carried out in the same year. In 1985 the Type 89 was demonstrated in a test site in Nankou, Beijing. The APFSDS rounds fired by the anti-tank gun penetrated 450mm armour at a distance of 2,000m. Extensive tests were carried out between 1987 and 1988 before the initial batch production began in late 1988. 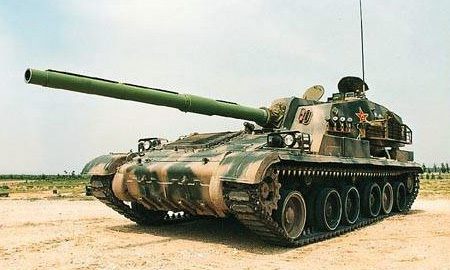 By 1989 around 20 examples were delivered to the PLA, and the Type 89 received its design certificate in 1990. It is estimated that more than 100 examples were built before the production stopped.